The .32 S&W Long is still a favorite for certain competitions (namely the ISSF 25 meter centerfire pistol competitions) that are picking up followers in the USA, and have had a long term following in Europe and other spots on the globe. This wadcutter round in the cartridge is a perfect practice round for those competitions. 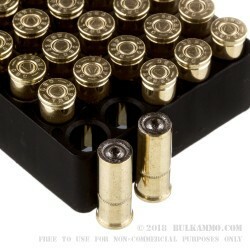 It features a 98 grain fully encased projectile that has a basically flat front for all intents and purposes. The general accuracy of the .32 S&W Long is very good, it was implemented in its original offering as a substitute for the notoriously inaccurate police/law enforcement round it was replacing. To this day there are thousands and thousands of shooters who still like shooting these rounds out of guns, sometimes made over 100 years ago. 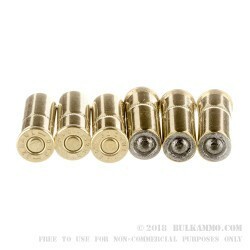 A couple notes: this cartridge is NOT interchangeable with the .32 Long Colt. It is not the same cartridge. This cartridge is, however, also known as the .32 NP (Colt New Police), though it is not a name you will generally see very often. 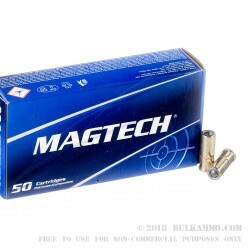 The .32 S&W Long firearms are often quite old and should be cleared as functional prior to using this newly manufactured modern ammunition in it. A: Wadcutter projectiles are adequate for defensive purposes in some cartridges, but .32 S&W Long is not highly recommended as a defensive cartridge. Shooting lead projectiles will require more attention during cleaning than shooting jacketed projectiles. Q: Why is 32 S&W long available on your site ONLY as wadcutter? 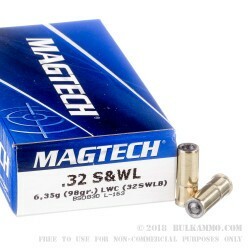 A: .32 S&W Long is not in high demand any more, and most people who are looking for this round use it for target practice or other use where wadcutter projectiles are an ideal choice.